The cost of the programme to electrify the Great Western Main Line between London Paddington (Airport Junction) and Swansea with routes to Oxford and Newbury and local lines in the London area has soared to £2.5 billion compared to the original cost estimate of £874 million made in 2013, and a recalculation in 2014 of £1.6 billion. The figure was revealed to the UK House of Commons Public Accounts Committee when Network Rail, the Office of Rail and Road (the amalgamated regulator) and the Department for Transport were questioned on 19th October. It emerged that the lack of main line electrification investment over the last 25 years has led to inadequate planning and scope definition as well as poor cost estimates. The Great Western project is being given priority over other routes where electrification is planned as the first all-electric Class 801 Hitachi-built 125mph Super Express rolling stock is due to enter service in 2017 but a requirement to keep within the £12.5 billion network enhancement budget for the current regulatory control period between 2014/19 has meant delay to other projects. 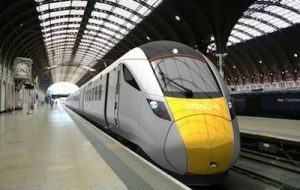 Electrification work on the Midland Main Line and Trans Pennine routes was paused in June but after an initial review NR has confirmed that they will proceed although only the Midland section between Bedford and Kettering / Corby will be completed by 2019. Wiring to Sheffield and Nottingham will not be commissioned until 2023 with a similar timescale for completion of the Trans Pennine route between Manchester and York / Selby. The latter is a key part of the Government’s Northern Powerhouse initiative which will see electrified rail infrastructure in place between Liverpool and Newcastle. The DfT has also made a direct award to Stagecoach to extend the current East Midlands franchise until 4th March 2018 with the option of continuing for a further year. This will enable electric rolling stock to be procured for services to Kettering and Corby. The timescale to re-open the route between Bicester and Bletchley and provide a through electrified line between Oxford and Bedford which was scheduled for completion in 2019 has not yet been decided. It is part of a plan to create an electric spine from Southampton via Oxford and Bletchley / Bedford to link with the West Coast and Midland routes engineered to convey 9ft 6in high containers on standard height container flat wagons. The conversion of the 3rd rail traction current system between Southampton and Basingstoke is also part of the project. In the background the need to enhance capacity has been emphasized by a continuing growth in passenger journeys which rose by 4.7% in the first quarter of the current financial year. This is the equivalent of 80 million additional annual trips that will raise passenger numbers to 1,735 million in 2015/16. FCP has extensive skills and experience in project planning, procurement and demand forecasting to support the development of business plans to meet industry changes which it has undertaken for a range of clients.